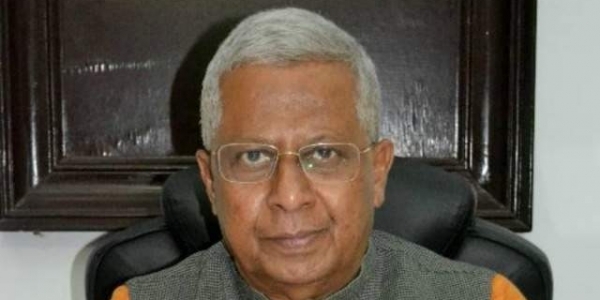 At a time when the opposition and several intellectuals have expressed fear that the BJP government is preparing to change the Constitution and make India a Hindu Rashtra, Tripura Governor and former BJP-RSS insider, Tathagata Roy has said that what was accepted in 1950 can be changed. “So far there have been 101 amendments to the Constitution, some of them under very questionable circumstances, as in the case of the 42nd amendment, when most opposition leaders were in jail (during the Emergency). “So after scoring a century, what are those ‘intellectuals’, Left-Nehruvian establishment to me, afraid of,” asked Roy, appointed Tripura Governor in 2015. He has authored a 450-page biography of Syama Prasad Mookerjee, the founder of the Bharatiya Jana Sangh, which morphed into the BJP. The Governor was responding to IANS questions in an email interview that sought his response on whether or not the fear of the opposition leaders and several intellectuals “holds ground” in the light of recent events. “That said, what man has made, man can certainly change. France has had five republics since 1792. We the people of India can change what we gave ourselves in 1950 if we think it ought to be done,” he said. Congress President Rahul Gandhi, writer-parliamentarian Shashi Tharoor, Salman Khurshid and historians such as Ramachandra Guha have repeatedly alleged that the real aim of the RSS and the BJP was to change the Constitution. Roy said that as the Governor of a state he had nothing to do with the BJP but, at the same time, his basic beliefs had not evaporated and were merely kept on the backburner. “It is indeed true that I share the ideologies of RSS and its Vividh Sangathanas and believe in the way they function,” he said. Roy still finds Vinayak Damodar Savarkar’s definition of a Hindu — one who was born of Hindu parents and regarded India as his motherland as well as holy land — to be “unduly restrictive”. “It is significant that the Supreme Court in 1995 defined Hindutva as a way of life rather than a religion, and declined to review its stand in 2017… As such, there is no difficulty in the Hindu mind to co-opt Allah or the Judeo-Christian God or Ahura-Mazda as part of the pantheon — in other words accept a Muslim, a Jew, a Christian or a Zoroastrian as an equal,” he said. “But if someone says that there is no God but Allah, and if you don’t say so I’ll make you do it by force, then surely Hindutva will have an issue with that person. It is said that too much of anything is bad. This is expressed differently by saying that we must all be open-minded, but not so open-minded that our brains fall out,” said Roy, a civil engineer by training, who was employed by the Indian Railways and later taught at Jadavpur University in Kolkata. Interestingly, Roy is full of praise for veteran BJP leader Lal Krishna Advani in the acknowledgement section of his book, though many veteran BJP politicians, including Advani, Yashwant Sinha and Shatrughan Sinha seem to have been sidelined by the new party high command. “I don’t put Advani in the same bracket with Yashwant Sinha or Shatrughan Sinha. Advaniji had dedicated his whole life to the RSS and the party, and brought about a sea-change by increasing the strength of the party in the parliament from two to 88. The latest ups and downs have nothing to do with my respect for the man, which remains very, very high. Even today he is regarded as an elder statesman,” he said. Asked of his evaluation of the new BJP high command, spearheaded by Prime Minister Narendra Modi and party President Amit Shah, he said he would not like to respond to it while he is the Governor of a state but “shall be glad to answer” after May 2020 when he demits office. According to Roy, Mookerjee’s politics had three principal features: Right-Wing, Indocentric and Constitutional. Tathagata Roy joined the BJP in 1990 and rose to become the state president for West Bengal and a member of the BJP national executive.